Imagine it’s New Year’s Day, 2016. Shad Khan is at his desk, stroking his mustache, deep in thought. His Jaguars have lost more than 11 games for the fourth time since he bought the franchise in November 2012. Not that he’s blaming himself, necessarily. Having not reached the postseason since 2007, this was, after all, a team mired in mediocrity. When Khan took over, he understood that an organizational overhaul was inevitable. Organizational overhauls usually mean one step back before any steps forward. The overhaul came a year later, in 2013. To spearhead it, Khan hired Dave Caldwell as his GM. 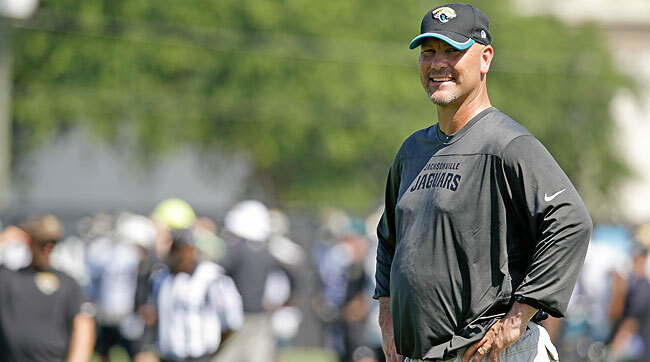 With Khan’s blessing, Caldwell hired Gus Bradley as head coach. Understanding the size of the rebuilding efforts before them, Khan gave Caldwell a five-year contract, realizing that he’d likely need at least the first three or four of those years just to gain traction. Bradley was given a four-year deal. Caldwell is the man Khan finds himself contemplating on this New Year’s Day. Age 38 at the time of his hiring, Caldwell had been heavily sought-after coming from Thomas Dimitroff’s front office in Atlanta. Before that, he had scouted in Indianapolis under future Hall of Famer Bill Polian. It reasons that Caldwell, like his mentors, believes in building through the draft. Khan can’t help but wonder if his GM had felt a little undue pressure in the 2015 offseason, when the Jags spent $79.1 million in guarantees to sign five notable free agents: tight end Julius Thomas, right tackle Jermey Parnell, defensive lineman Jared Odrick, outside linebacker Dan Skuta and cornerback Davon House. Now Khan is looking back on the 2015 season. With the exception of maybe Parnell, who’d been a backup in Dallas and showed why with his poor mechanics and lack of quickness, all the free agents were fine in their first year with the Jags. Thomas created favorable matchup problems in the passing game; Odrick was a beast, particularly against the run; Skuta proved not quite as proficient in a 4-3 as he’d been in San Francisco’s 3-4, but he played with a motor and had a way of surpassing opponents’ expectations; and House was a deft outside corner who could play zone or man. He’d even slid into the slot a few times. Khan reasons that his worries about the 2015 free-agent investments are probably just his hindsight playing mind games. Besides, with the elevated salary cap and a young roster, the Jags had the money to spend on veterans. And they’d certainly had immediate holes to fill. None of the free agents appeared to be significant difference-makers though. After all, here Khan’s team is on New Years Day slated to pick near the top of the next draft. What a waste of playing in a weakened AFC South. Khan’s mind, continuing to wander, touches on other decisions his GM has made. You have to start with the hiring of Bradley. Everyone likes the guy, including the players. His enthusiasm is contagious. But it’s true, Bradley had overseen an exceptionally talented defense in Seattle, where his work as coordinator propelled him to the head coaching searches. Seattle’s collection of talent had enabled Bradley to prosper with a straightforward hybrid zone scheme. The coach never had to outsmart opponents, his players just had to out-execute them. Which isn’t to say Bradley didn’t deserve the credit he got in Seattle. Someone had to teach the scheme’s fundamentals and nuances to those talented young players. But now there’s no disputing that Bradley’s scheme has not prospered the same way in Jacksonville. The Jaguars ranked 28th and 26th in points allowed in his first two years on the job, and Year Three wasn’t much better. The question Khan ponders is: Why? Did Caldwell hire the wrong coach? Or has the GM failed to find the right players? Granted, there has been some bad luck—really bad luck—along the way. Jacksonville’s most recent first-round rookie, No. 3 overall pick Dante Fowler, tore his ACL in the first rookie minicamp. That’s football’s version of wrecking a new car 10 minutes after driving it off the lot. The year before, in October 2014, veteran middle linebacker Paul Posluszny, the defense’s backbone, was lost for the season with a torn pectoral. And at the end of 2014, defensive tackle Sen’Derrick Marks, who had more than lived up to the four-year, $22 million extension he’d signed in late 2013, tore his ACL. Though injuries are part of football, Caldwell could reasonably point to these as significant setbacks. And he could also point out that some young players had overachieved under him and Bradley. Linebacker Telvin Smith, a fifth-round pick in 2014, is one example. He played with fluidity and awareness down the stretch as a rookie and built off that in Year Two. 2013 seventh-rounder Demetrius McCray, who being a lanky 6-2 has the build that Bradley likes at outside corner, had blossomed into a starter. But every team has a few late-round success stories. What about the misses and foul balls? Like 2013 second-round safety Johnathan Cyprien? By and large, he’d proven an okay player, but little more. Did Caldwell miss on him? Or did Bradley not coach him right? What about the previous year’s second-rounder, defensive end Andre Branch? He wasn’t Caldwell’s pick, so no blame there, but why hadn’t he become another version of Chris Clemons under Bradley’s tutelage? Injuries were a factor, but Branch had been up-and-down when healthy. Or what about 2013 third-rounder Dwayne Gratz? Promising as a rookie, inconsistent as a sophomore and likely headed for a long-term nickel role. Regression in young players is always alarming. Then there are the issues on offense. Bradley originally hired Jedd Fisch as coordinator. That was a mistake. The Jags finished dead last in scoring and second to last in yards in each of Fisch’s first two years. In 2015, Bradley fired Fisch and brought in well-traveled play-caller Greg Olson. Olson over the previous 10 years had held coordinator jobs in Detroit, St. Louis, Tampa Bay and Oakland. The wide-reaching connections he’d made from so many stops had put him in a lot of rolodexes. Other coaches understood that Olson had never been given a true franchise quarterback to work with. Bradley wanted to give him that chance with Blake Bortles. After just one year together, there probably isn’t enough evidence for Khan to pass judgment on the coordinator and quarterback. Bortles is clearly comfortable playing on the move, and he’d thrown into coverage less often in 2015 than he did as a wide-eyed rookie. But too often issues along the offensive line still left him with no chance. Which is another reason Khan finds himself deliberating over Caldwell. Caldwell’s first draft decision was taking left tackle Luke Joeckel second overall, despite the Jags having direr needs elsewhere. Joeckel so far has been a disappointment. His susceptibility to the bull rush is disconcerting. Caldwell also spent $12.5 million in guarantees on guard Zane Beadles in 2014, only to quickly see why the Broncos had willingly let him leave in free agency. Beadles steadied after a slow start, but he’s been nothing special. Caldwell tacitly admitted this by drafting guard AJ Cann in the third round in ’15, even though he’d also drafted guard Brandon Linder in the third round in ’14. And then there was the over-spending for Parnell. He’d been better than previous right tackle Austin Pasztor, but not $14.5 million guaranteed better. The deficiencies along the O-line had contributed to Jacksonville’s continued struggles in running the ball. Toby Gerhart—another bad free-agent signing—proved to not be the answer in 2014, so Caldwell spent a second-rounder on Alabama’s T.J. Yeldon, hoping he’d become the next Eddie Lacy, not Trent Richardson. Caldwell had also spent second-round picks in 2014 on Marqise Lee and Allen Robinson, two wide receivers who were better equipped for a spread offense. That sticks in Khan’s craw. Because what’s apparent after watching Bortles for two years is, with his somewhat methodical throwing motion, he’s more suited for a traditional dropback pocket passing game. So why give him spread receivers? It feels like too many of Caldwell’s moves have had this sort of subtle incongruence. Almost as if the plan has been not to build a certain type of football team, but rather, to plug as many holes as possible and see where things end up. Wanting to not be impetuous, Khan will not make any decisions here at his desk on New Year’s Day. In the back of his mind, he knows he’ll probably stand pat and treat 2016 as a make-or-break year for his GM and head coach. This wasn’t what the owner had wanted, of course. Pressure isn’t necessarily the best way to build a strong business. Then again, it’s the NFL. If your leaders can’t work under pressure, it means you picked the wrong leaders. 1. 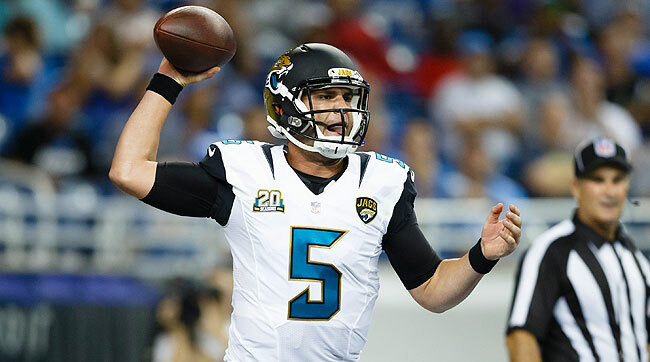 Expect the Jags to put Blake Bortles on the move this year. That’s a way to make a young quarterback more comfortable, plus Bortles shows promise in this capacity. Don’t be surprised if this includes four or five read-option snaps a game. 2. 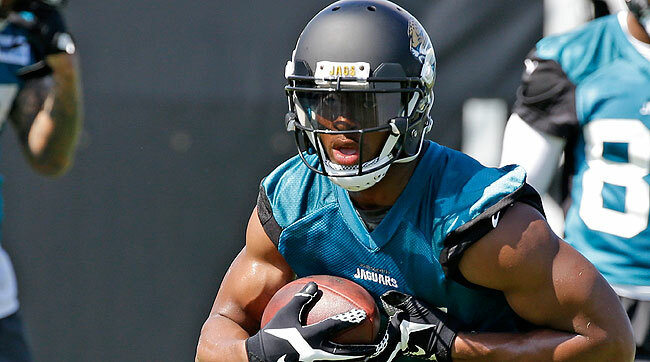 Wide receiver Allen Robinson’s development will be critical in 2015. Robinson showed talent as a rookie, but he has a lot to learn in terms of route running nuance and reading defenders. It didn’t help that he missed the last six games with a broken foot. 3. Despite a few bright moments in nine starts last season, Denard Robinson is not an every-down back. But he can be a viable regular presence as a gadget weapon—think someone cut along the thread of Sproles/Spiller/Bush only with a tad more versatility and a tad less pure running formidability. 4. Cornerback Aaron Colvin’s performance could carry a lot of weight in how Jacksonville’s defense fares. A highly touted prospect entering 2014, Colvin fell to the fourth round of the draft after tearing his ACL at a Senior Bowl practice. He became Jacksonville’s primary slot defender down the stretch last season. A slot corner who can match up underneath is a critical component of Bradley’s system. 5. Don’t be surprised if Ziggy Hood drops off the map. The former Steeler was much too quiet last season after signing a four-year, $16 million contract in free agency. Hood is best served as a three-technique in nickel, but the Jags have Sen’Derrick Marks, Abry Jones and even Jared Odrick as options for that role.